1, What did types of work would earn you this badge, i.e. what were the criteria? 2, Who was it issued to, just ex-pats, or others? 3, When was it issued, and in what sort of numbers? Could anybody add anything to the above? I'd be most interested in any further information-I can't seem to see it in any of the texts I have, or on the web. Interests:Medals and research, esp. the imperial German army and the US AEF. <br />A Glasgow Rangers fan. Prof. Ed Haynes will know for certain. He is the world expert on Indian awards (outside of India proper). Try him at the OMSA.org website, where he is a stalwart. Many thanks indeed, I shall do just that! 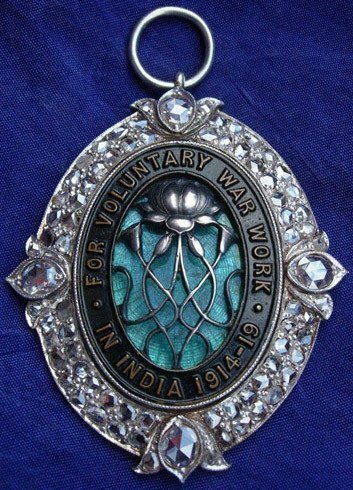 The Indian Voluntary War Work Badge was awarded to civilians, both Indians and foreigners, for contributions to the war effort. I have been intending to do an article for the OMRS or OMSA journal, and this question will prompt me to dig out my notes. I have full information, but don't keep it in what remains of "active memory". They are, as you observe, quite undocumented and generally unknown, so they are pretty cheap. I have been told that (some?) badges issued to natives (of the British Isles) were named, though I have never seen one. Sorry that isn't much help, let me dig through my notes. On the contray, that is of great help, thank you very much. I can provinance this example to belonging to one Colonel James (or possibly his wife) but have done no significant research so far. I've only ever seen one other example, which was being offered on a dealers site for three figures, but assumed they must have been issued quite widely? I would greatly encourage your article as I'm also quite interested to learn more about this badge. The one we have has no original box and has been modified with real diamonds. The gemstones alone are pricey so I was sorry to see the badge itself described as cheap. Photos here of obverse and reverse. Please do let me know if you can contribute more information about this lovely piece. I have my maternal grandfather's badge which was awarded to him following his work at the Calcutta Rifle Factory. It looks identical to the first one pictured although the lotus flower appears to be a steely blue. 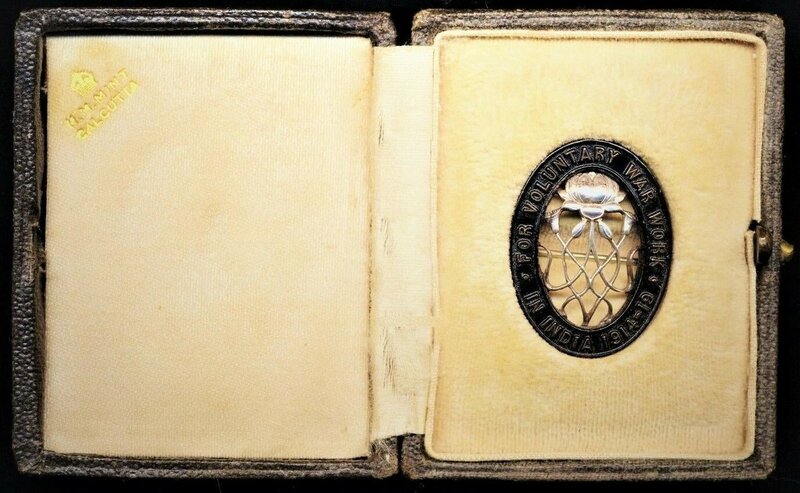 He received it prior to his departure from Calcutta in 1920. I would be very interested to know if the article promised by Ed Haynes ever appeared. I know very little of my grandfather's position and would appreciate any help that members could give me. Firstly welcome to this Forum and secondly, thank you for drawing my attention to this topic which I had not discovered before. 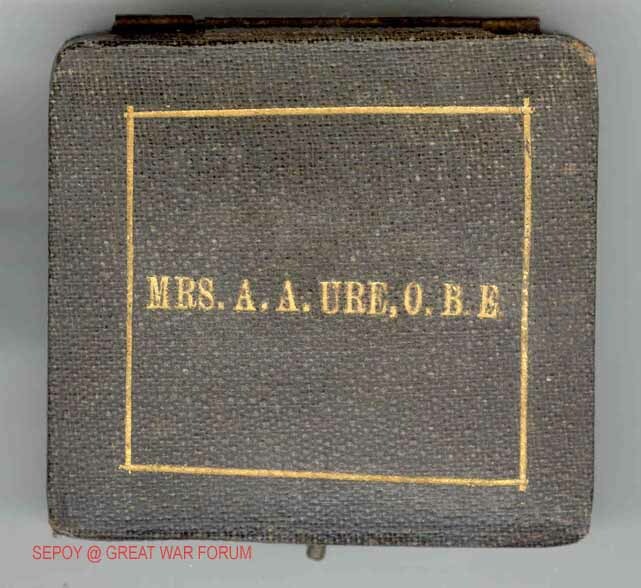 I have come across two boxed examples of these badges - one to a Lady Knox and the one illustrated below, which is in my collection. I am not aware of any article written on the subject by Ed appearing in the OMRS Journal but I cannot comment about OMSA as I am not a member. I would be very happy if he has. I believe that my badge was awarded to Georgina Jane Elizabeth Linn who married Arthur Anderson Ure in Rangoon, Burma between 1896 and 1900. 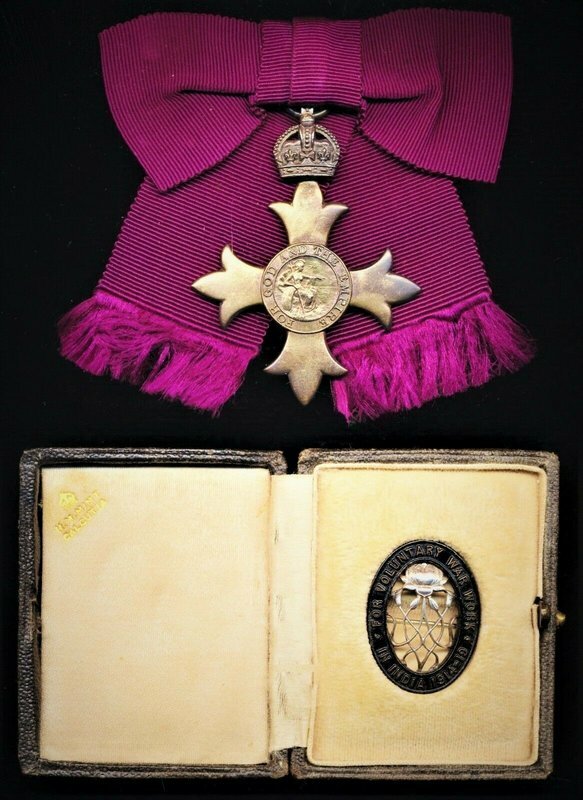 Other than she was awarded an OBE, I cannot add much further information, mainly because I cannot gain access to all my reference books at this time, as I might wake my Wife! The beautiful example in elizz00's post has been altered from the usual pin back badge and mounted in the jewelled pendant frame. This is a perfect example of the pride taken in wearing a war service badge. The badges themselves are not expensive from a collecters point of view (maybe a better way of describing them) but with the box, provenance and in this case diamonds, will raise the value substantially. I found this thread when I was researching this badge. I didn't have anything to add at that time but I do now. Since the thread started 10 years ago I hope that some of those who contributed are still members of the forum. 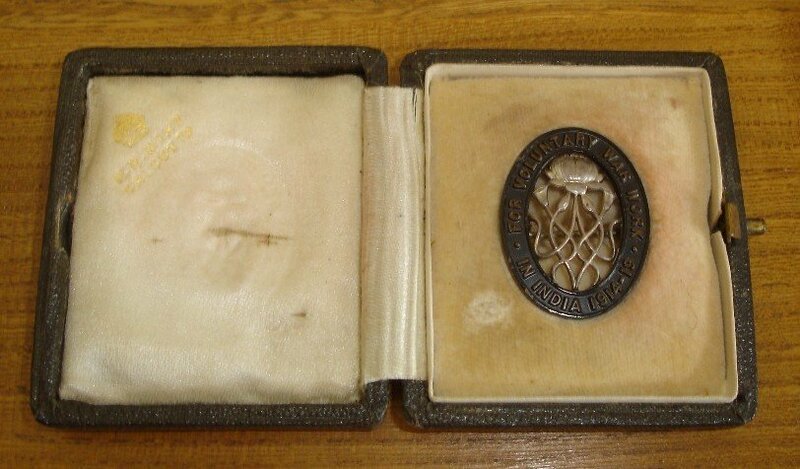 I recently bought one of these badges, plus an OBE, that was presented, probably in 1920, to Mrs. Hilda Mary Moncreiff-Smith. 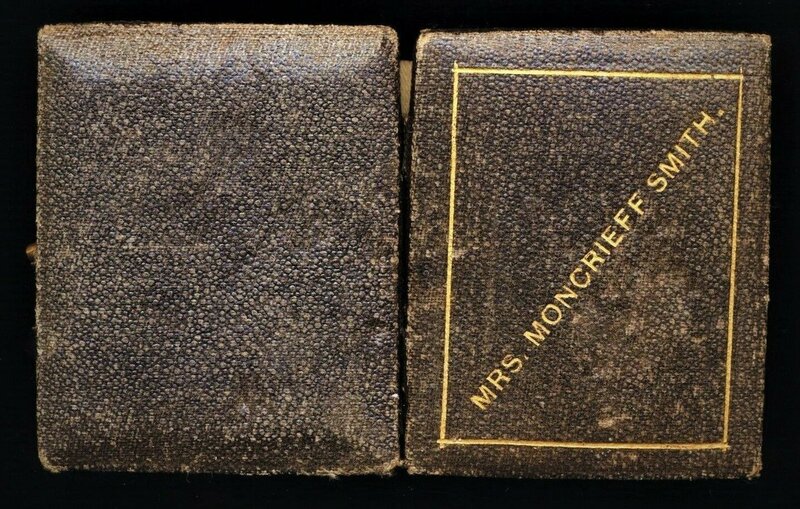 Wife of Sir Henry Moncreiff-Smith. A career member of the I.C.S. In 1964 there was an article in the Journal of the OMSA about this particular badge that I found the first page of on line. Unfortunately, I have not been a member of the OMSA long enough to be able to access the JOMSA archives. I can post the url where I found on line with first few lines of the article. I'll also leave pictures of my badge and the OBE that came with it.